Friday the 6th of March the IT department in Novo Nordisk Group will offer 10 million shares to the public making NNIT an independent company. This accounts for 40% of the total shares in the company, as Novo Nordisk Group maintains the majority shareholder position with 51% of the shares. Because of the size and the costumer segment, the exposure of NNIT to Novo Nordisk is unrelated to the business; as a result, parent company wants to list the department. The most important to Novo Nordisk Group was to ensure a success initial public offering rather than maximizing their gain. With the latest Danish IPO going bankrupt, analysts suggested that an IPO in this period would be risky. This is why the price range was initially set from 100 DKK to 120 DKK. The management have been very cautious in their estimations because they want make a successful IPO, because a less successful IPO would may damage Novo Nordisk reputation, which could be harmful for their own share price. This could be a reason why the price of NNIT is relatively conservative. But the time would tell this have not been a problem resulting in a new price range: 120 DKK – 130 DKK. Increasing the price range advocates an underestimation and a large demand for the stock. This could be a strong signal for the investor to buy. NNIT is one of Denmark’s leading consultancies in IT development, implementation and operations. NNIT focuses on delivering services for customers with complex IT solutions within industries influenced by intense regulation. Most of its customers is within the ‘life science’ sector in which Novo Nordisk is dominating. NNIT used to be an integrated part of Novo Nordisk but is today an independent company thought fully owned by Novo Nordisk. NNIT has more than 2,300 employees dispersed around the world, but with the majority of the employees situated in Denmark. As part of the forthcoming IPO 182.125 stocks (0,73%) are reserved for the management as part of NNIT’s incentive program called ‘Long Term Incentive Program’ (LTIP). With the upper bound of the IPO share price of 130 DKK this constitute a premium of 23,7 million DKK. With a vesting period of 3 years, the program gives the management an incentive to perform well and remain within the company. The key figures within the management of NNIT consists of CEO Per Kogut and CFO Carsten Krogsgaard Thomsen. Per Kogut, MSc in Political Science, has been CEO in NNIT since 2007. Per came from a position as CEO of CA Northern Europe and has previously been Director at SAS Group. Carsten Krogsgaard Thomsen was a member of NNIT’s board for a number of years before becoming CFO at NNIT in January 2014. Carsten has experience from management positions in Danish industry, most recently as CFO at Dong Energy and CFO at DSB. Overall, the management is very competent. Investment Panel Aarhus sees the follow three key challenges for NNIT in the approaching period. NNIT is operating in a highly competitive and fast changing global market. NNIT faces competitors with great financial and marketing resources as well as lower cost base especially from their offshore competitors. To mitigate this increased risk NNIT should concentrate on price competiveness. We believe that customer concentration risk pose a great threat for NNIT since top five customers, including the Novo Nordisk Group, accounted for 52 percent of the net turnover in 2014. This means that NNIT is highly dependent upon the IT spending of these companies. 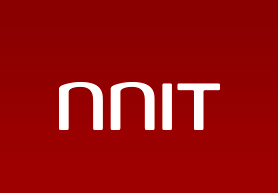 NNIT has grown considerably in recent time. In a seven-year period, the number of total employees has risen from 1,000 in 2007 to 2300 in 2014 with Novo Nordisk Group gradually account for a lesser percentage of the total revenue. In order to keep this development NNIT must expand its services in response to changes in technology and customer demands, which might be complicated and therefore poses a risk. Is the new price range fair? NNIT have managed to maintain a stable business and, hence, we expect the revenue grow at the same rate as historically. However, the CFO, Thomsen stated at the Investor Meeting that the company expected a growth rate of 5%-8%, but given the circumstances of recent Danish IPOs and the directors desire to be very careful, we set the growth rate of the revenue to 10% being a very likely case. With very volatile capital expenditures, the growth rate of 5 % – 6 % set by the directors is, however, very likely and paints a conservative picture, as the growth is 2% on average in the industry. NNIT is an all-equity-financed, very stable business, suggesting that the cost of capital do not need any adjustments for risk. We consider a WACC of 7.6% plausible. Discounting the unlevered free cash flow results in an estimated market value of the equity in NNIT of 4,2 billion DKK and a share price of 167,35. Compared to the maximum bidding price of 130 DKK, an upside of 28,7% exists. There are no evidence suggest that the cash flow needs a more aggressive discounting factor, but to evaluate possible changes in performance and risk, the scenario analysis proves, the maximum bid price of 130 DKK is below the likelihood. The Company’s P/E is below the peer median with 17 %, which is positive, while the P/B and P/S is far over the peer median (respectively 124 % and 71 %) and influence negatively. 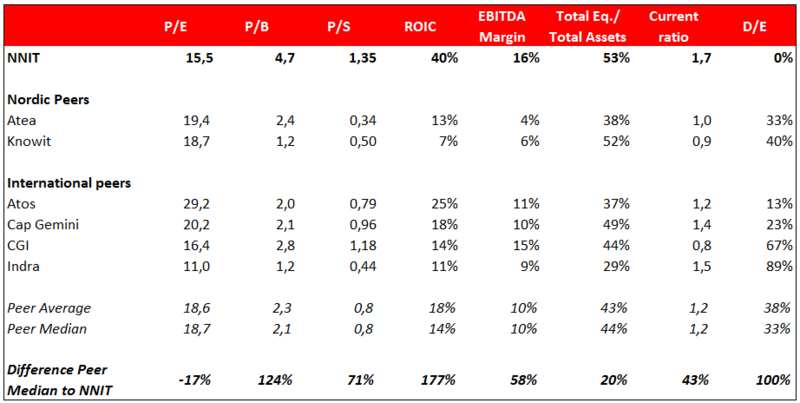 Nevertheless, the high P/B and P/S analysis should take into account the significant better performance of ROIC with 177 % higher rate than the median, and the strong EBITDA margin to the median at a better performance of 58%. The current ratio at 43% better than peer median also indicates a strong company in good financial health with ability to pay back the short-term liabilities. The current ratio is also underlined by a 20 % better than peers in total equity / total assets and the 100 % better D/E to median indicates a low risk company compared to the other peers. The hectic time for IPOs have no effect, as NNIT is a healthy company with gains for investor. We expect an upside of 29% given the fair value of 167,35 DKK. This can prove that the management were careful when setting the price range at 120 DKK – 130 DKK and may have a great chance to outperform their competitors. Overall, our recommendation at NNIT looks like a great BUY. The investment panel is yet to purchase NNIT, as the shares were unavailable at the time of analyzing. However, we will follow the price at NNIT and try to find a great entrance.